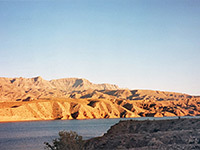 Pearce Ferry marks the boundary between Lake Mead and the Grand Canyon, where the low sandy banks around the lake give way to imposing, colorfully-layered cliffs that enclose the Colorado river for the next 280 miles upstream. 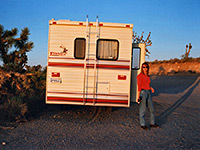 At lakeside there are only a few buildings, a small marina and a campground (the ferry no longer operates). A track leaves just west of the marina and branches across the undulating cacti-covered land adjacent to the water, ending at small promontories about 20 feet above the lake; this whole area is a very relaxing place to stay for a few days, with very few people and none of the litter that often spoils lakeshore campsites in this region. In recent years, however, water levels have fallen significantly and the lake begins several miles downstream. 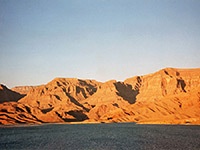 The Ferry is located at the end of a 52 mile road, starting from US 93 half way between the Hoover Dam and Kingman. This is a fascinating drive that passes by much dramatic scenery and several places of interest. The first 8 miles are across the flat Detrital Valley, through Dolan Springs - a typically scattered desert town with isolated houses surrounded by a large selection of broken vehicles and old pieces of machinery, all rusting away under the sun. The general store is worth a visit as it stocks every conceivable item and has a good collection of western memorabilia. Beyond town, the road climbs into the White Hills and then across the Hualapai Valley. 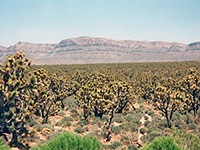 Joshua trees begin to appear and grow steadily thicker eastwards, and around the hills at the far side of the valley, at elevations of 4,000 feet, they grow as densely as anywhere in the Southwest. The trees are large, old and well-branched, and the whole spectacle is even more impressive than the Joshua Tree National Park in California. Just before the main concentration of trees, the Pearce Ferry road meets with Antares Road, a long dusty track linking with old Route 66. 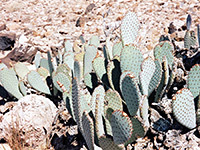 The main road climbs, and the Joshua trees are replaced by various species of cacti - several types of spiny opuntia, clusters of echinocacti and large barrel-shaped ferocacti. An unpaved side road forks east, passing through rocky, uninhabited land to the Quartermaster Viewpoint, a high plateau overlooking the Lower Granite Gorge, part of the western end of the Grand Canyon. It then meets the Buck and Doe Road that links Peach Springs with Grand Canyon West, where the Hualapai operate Grand Canyon Skywalk, a projecting walkway over the canyon which has become by far the main tourist attraction in the Hualapai Indian Reservation. Further along the main road there is more scattered habitation until about 5 miles from Lake Mead; after here the surface becomes unpaved and the track descends quite steeply along a dry, sandy valley (prone to flash floods) towards the waters edge. Camping is free, either in a site with designated places and quite good facilities, or along the rough tracks by the lakeshore. The water in Lake Mead becomes pleasantly warm in summer, when air temperatures often top 100 ° and fierce, hot winds are common. Pearce Ferry is the final destination for raft trips down the lower Grand Canyon, particularly those run by the Hualapai Indians, which depart from near Diamond Creek at the end of Peach Springs Canyon in the morning and emerge late afternoon onto the calm waters of the lake after around 8 hours sailing. The rafts pass in front of the high red cliffs that form a backdrop to the east end of the lake, and which are particularly striking at sunset.